Anne Stokes at Elfia Haarzuilens! 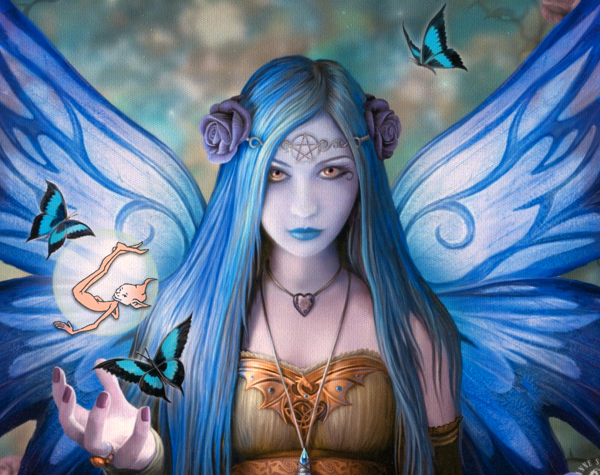 When you see a nice fantasy painting, chances are it is made by Anne Stokes. Her lovely art has been widely acclaimed art can be found on a range of products worldwide. Her hugely popular fantasy art covers a wide range of subjects. Unicorns and fairies, mermaids and vampires, dragons and monsters, painted in gothic and classic fantasy styles. Anne will be attending Elfia on both Saturday & Sunday, signing her art and giving a talk on Unicorns. As a full-time illustrator, Anne Stokes fills her days with creating and expanding the ranges of her fantasy themed paintings. Besides the wide range of fantasy creatures, she also uses symbolism in her pictures. These symbols help the artwork to convey meaning. Before working solely on her own art, Anne Stokes worked as a merchandise designer. Her work can even be found on band merchandise of Queen and the Rolling Stones. Anne also worked as a jewellery designer and sculptor. She put her own designs on t-shirts, which are worn by various tv characters and many bands of note. Anne kept doing what she loved and decided to become a full-time freelance illustrator. She worked on a number of book, game and record products, which included producing concept art and illustrations for Dungeons and Dragons. Working with Art Ask Agency her many paintings have been licensed on a wide range of products which are on sale worldwide, including T-shirts, posters, book covers, calendars, jigsaws, tarot cards, sculptures, mugs, jewellery and greetings cards. She continues to produce new works and has published several books. Anne will visit Elfia on both Saturday and Sunday. She can be found at the stand of Het Stripfiguur fantasy art where she will sign her art. Want to learn more? Keep an eye on the programme as Anne Stokes will be giving a talk about unicorns! Don’t want to miss this? But your tickets now!